Salzburg is easily my favorite city in Austria and one of my all-time favorites in Europe. From the moment I arrived I knew it was love at first sight. Filled with graceful old world charm and subtle classiness, this city is home to one of the world’s most loved movies, The Sound of Music and the world’s most creative music composer Mozart. Save a few days to relax and enjoy the beauty of Salzburg. The city relies majorly on tourism due to its spectacular architecture, countless lakes and snow clad mountains. I spent 3 days walking up and down the streets, admiring the architecture, gorging on schnitzels and enjoying the relaxed feel of the place, waving as horse carriages went by. Without wasting more time, let me help you discover this charming city and fall in love with it just like I did. Tour the city: There are many great sights littered all over Salzburg, so it’s worth your while taking a city tour whilst you’re there. 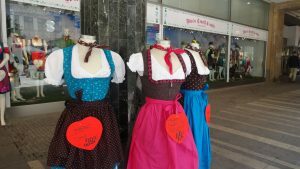 There is plenty to choose from, wander through the old town, admire the baroque architectural monuments, medieval Churches and castles, hire a cycle and tour the charming country side or attach your lovelock onto the fence of the bridge spanning the Salzach river and throw the key away as you declare your eternal love. 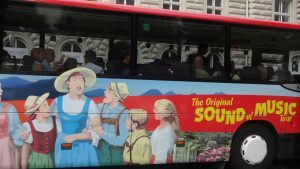 Sound of Music tour: Fans of the movie, must take the tour. Its absolute fun, lasts for around 4.5 hours, with a guide who gets you to sing ‘These are a few of my favourite things’ as you drive to Mirabel Gardens famed for Do Re Mi, where you can marvel at the freshly cut grass then head off to the gazebo where Liesel sang 16 going on17. Hohensalzburg Castle: This majestic castle stands atop a hill, towering over the city and is one of the largest medieval castles in Europe. Construction of the castle took hundreds of year to complete. During the 20th century it was used as a prison for Italian prisoners of war and Nazi activists. There are numerous chambers to walk through and definitely worth a visit. Mozart’s House: A visit to Salzburg would be incomplete without a quick visit to see where the legend, Mozart was born and where his family lived. At the house, now converted into a museum you will find the instruments Mozart used. To be in the midst of these items, once touched by the hands of one of the greatest musical minds in history, is a treat in itself for music lovers. Lake Gilgen: Drive into the country side to this hidden gem. Change into your swim suit and dive into the turquoise waters while the lofty Alps surround you. Werfen Ice Caves: A 40 minutes train ride from Salzburg, pay a visit to the world’s largest Ice Caves. The tour lasts for around 1.25 hours and you will be handed a headlamp before you enter. The tour begins every 1 hour and is in English and German. Underground Salt Mines: Don’t miss a chance to explore the underground Salt Mines. Before entering the mine you will be asked to dress like a miner and then travel by the miners train into the heart of the mountain. Once inside the local miner or guide will amaze you with tales of the history of salt, how the mining process is done. Augustiner Bräu : Its big, its loud, its noisy, its fun, its excellent! Choose to go here, make friends with the locals and join their table. 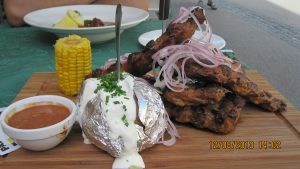 Enjoy the chatter, while sipping on some beer and gorging on schnitzels and sausages. This is a popular hangout place, rich in character with a lovely garden. It is Austria’s largest beer inn where beer is sold in stone-made pitchers draught directly from wooden barrels. Getting There: Salzburg is well connected to Vienna the capital of Austria by road and rail. Within Europe, Salzburg is easily accessible from Munich and Zurich. 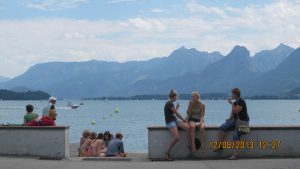 I drove from Lucerne to Salzburg which was around an 8 hour drive with stopovers. If you are based in Munich, and on a tight schedule, Salzburg is a day trip and definitely not one to be missed. Stay: Many hotels and bed and breakfast inns are available. Consider staying with a local family for a cultural experience. I stayed in a hotel on the other side of Salzach river around 10 minutes’ walk from the old town. Salzburg is great for family holidays with kids, a romantic getaway with that special someone and a safe an exciting destination for hiking and treks for the adventurous. A visit to Salzburg is guaranteed to make you come back for more!